The Bukidnon Sub-watershed in the municipality of Talakag covers about 64,000 hectares, making it one of the major tributaries of the Cagayan de Oro river. This assessment was conducted to determine the constraints to agricultural productivity and ecosystem balance in the area. The Bukidnon Sub-watershed in the municipality of Talakag covers about 64,000 hectares, making it one of the major tributaries of the Cagayan de Oro river. This assessment was conducted to determine the constraints to agricultural productivity and ecosystem balance in the area. Specifically, it was pursued to investigate the absence of a tree-planting program, the non-observance of any wildlife conservation plans, and other potential management concerns. The results of the research project are intended to guide the local government units of Bukidnon and other local organizations towards more appropriate, responsive, and integrated environment management interventions. Why Conserve Biodiversity in the Bukidnon Watershed? 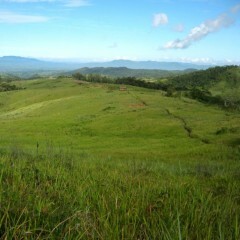 The Bukidnon Watershed is considered as one of the most challenged ecosystems. The sub-watershed in Baylanan-Talakag, Batang, Baningcol, and Sanga-sagayan near Talakag, Bukidnon is one of the major tributaries that provide huge volumes of flowing water down to the Cagayan River. The sub-watershed is home to various species of flora, at least 212 of which were sighted and identified during the two-day transect walk involved in the study. From this total, 43 species are Philippine endemics. Original vegetation is already lost due to timber poaching and unsustainable farming practices such as kaingin (slash-and-burn). The area is also prone to weather-related destruction, as proven by Typhoon Sendong (2011). Total population is recorded at 1,423, with 682 male and 741 female residents distributed across 307 households. 99% of this population are of Higaonon ethnicity. Farming is the primary source of income in this sub-watershed. The common crops may be classified as either productive (corn, carrots, sweet potato, cassava, abaca, eggplant, avocado, and sayote) or non-productive (rubber, coconut, citrus, mango, pineapple, and banana). A few residents rely on backyard poultry (chicken) raising, while others hunt wild pigs in the forest. Income levels of the residents fall well below the poverty line. Habitat destruction by way of land conversion, shifting cultivation practices, timber poaching, indiscriminate hunting practices, soil erosion, and flooding during heavy rains, among others. Chemical pollution as a result of pesticide/insecticide/herbicide use and application of inorganic fertilizers. Indiscriminate introduction of alien species. There is no legislation to promote and enforce a tree-planting program or a wildlife conservation plan in the area. Capacity building to empower the people in the communities that belong within the sub-watershed territory through trainings, workshops, and transfer of agroforestry technology. Education about soil rehabilitation and amelioration, as well as enterprise and cottage industry development can also help enable and support the residents of the sub-watershed. Socio-economic support by addressing issues concerning food security and prevalent poverty. Increased availment of social amenities and services and the promotion of education and increased productivity are also recommendable actions in this regard. The establishment and reinforcement of the area’s peace and order situation are also integral elements to this end. Infrastructural developments such as additional farm-to-market roads, improved water systems, and improved health services.